Richard lives in sunny Queensland, in the valleys of the hinterland of the Sunshine Coast at Crystal Waters community, where he works as an astrologer and Feng Shui practitioner doing consultations and continues writing for various magazines and newspapers. He organises the 2 day Crystal Waters Astrology Conference each year in October. The Venus Transit of June 2004 during the Venus Retrograde phase is a rare cosmic event that this year is laden with spiritual significance. Richard Giles examines this remarkable phenomenon. This year we'll experience a once-in-a-lifetime rare astrological and astronomical event. Approximately every 121 years, the planet Venus moves between the Sun and our line of vision so that Venus passes directly across the face of the Sun. When the Moon passes across the face of the Sun it's called an eclipse. When a planet passes across the Sun's face it's more precisely known as an occultation. On June 8th, 2004 we will be able to see the small shadow disc of Venus transit across the Sun maintaining its passage for about 6 hours. The last occultation was December 1882 and each time the occultation occurs it comes in twos, the second one being 8 years on. The previous first one was December 1874. The other transit this century will be June 6th, 2012. Following that, the next time is 2117. Venus transits seem to presage great shifts in human consciousness and this June promises the same. If we look back at the last several occultations: in 1518/26, 1631/39, 1761/69 and 1874/82 we can pick up patterns. They all occurred in Sun signs Gemini or Sagittarius. Looking at the events of 1519, Magellan del Cano set about the first circumnavigation of the world. The impact on European civilisation was immense, showing clearly that the world was a globe. The Reformation began in western Europe and the age of female rulers came to Europe - Mary Queen of Scots, Mary I, Elizabeth I, and Catherine de Medici and all reigned then. The next pair of 1631/39 coincided with the beginning of the first regular mail services in Europe. Also came the rise of rationalist science, beginning to get its hold over the western mind. The 1761 transit was the first to be observed in an international co-operative effort, by scientists from around the world setting up at 70 different locations. The American revolution had its origins in this period. In 1874/82, the Venus transit coincided with the founding of the World Postal Union and the completion of the Atlantic telegraph cable. Also in those years Alexander Graham Bell first conceived the idea of the telephone - global communications began to be a reality. In the same period, the rise of women's suffrage eventually led to women being given the vote in NZ, the USA and Australia. The Mayan civilisation, along with the Aztecs and Incas, which were crushed by Spanish and Portuguese expansionism after the 1518/26 transits, all place tremendous important on Venus cycles. The Mayans regard the cycles of rising and setting of Venus near the Sun (heliacal cycle) as a key timing trigger in the world. Within the Indian Vedic traditions, the 120 year Venus transit cycle is also regarded as of major importance. It's not surprising then that the second Venus transit of this decade falls in June, 2012, just six months from the end of the Mayan calendar in December 2012. In the finest of the early Mayan books, the Dresden Codex, the beginning of the Great Cycle in August, 3114 BC is referred to as the "Birth of Venus". As well, several of the surviving Mayan manuscripts also refer to Venus as a Sister Planet of Earth. And Mayan prophecy states that the renewed world of new consciousness will be born on the occasion of the Venus Passage across the Sun of 6th June 2012. The Mayans had also been able to determine the exact timing between Venus passages to the number - 583.92 days. Without fine optical observation instruments, how were Mayan astrologers able to discern such an exact timing? There has to be a reason why they put so much into this cycle. They also knew there was a link between the time Venus takes to revolve on its axis, Earth timing and the years between Venus passages across the face of the Sun. There are 243 years between a pair of passages and thus the Earth will have revolved 243 times around the Sun, while Venus has revolved on its own axis 365 times - which is the length of time in days that the Earth revolves around the Sun. The cross-links are amazing and known to the Mayans for several thousand years. The eight years that pass between each occultation are fecund processing moments for new ideas and world change. Previous cycles show that global communications and a shift in consciousness regarding the scope and nature of the world are all part of these transits. The other focus is Venus's role as female entity and ruler of the feminine, the creative and as an artistic channel for new breakthroughs. The Sun in astrology represents masculine energy and the principle life force in our Solar System. It's at the centre and from its position, it drives all the planets. In a chart it's your vital life force, the ability to give and receive, leadership, generosity and drive. Venus is the female love principal in astrology. It's the primordial Yin energy of our system. 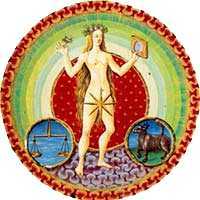 It's harmony, beauty, sociability, co-operation, women and the goddess energy. So when Venus aligns with the Sun (from our Earth's perspective), the principle life force is united with love, female energy, harmony and the goddess principle. The June occultation occurs at 18 degrees Gemini with a strong opposition to Pluto. This means very powerful energies are released to harmonise the masculine vital force enabled by the transformational energies of Pluto - almost irresistible! A powerful time of transformation for our very disturbed and disrupted world. This Venus transit couldn't be happening at a better time. Go to the NASA website for details on where to see the Venus transit and at what time of the day. In eastern Australia, where this website is based, the Sun will set whilst Venus is still passing across its disc. It gives an opportunity to actually look at Venus on the Sun's face while it's sitting on the horizon. Normally you cannot look at the Sun as it burns your retina, but at the moment of sunset the Sun's disc is sufficiently dulled by the atmosphere to watch. In other parts of the world the Sun will be above the horizon for most of the transit. If you can, get yourself in a position where you can see the June 8th setting Sun and watch as it dips onto the horizon. If not it will be broadcast live on the internet on a number of sites or shown on national television in most countries. From Brisbane, Sydney, Melbourne, Hobart and Canberra Venus begins its passage at about 3.07 pm and the Sun sets just before 5.00 pm. You'll have just less than two hours to observe it. In Adelaide the passage begins at 2.38 pm and in Perth at 1.10 pm. Stand up and look out at this rare cosmic event—you'll only see it once more this lifetime.